Home » Barkerville » Museum Geek – Out! As I write this, my final scheduled article, it is the last day of the 2013 Barkerville season. Our closing special event, the Geekenders Lost in Time 2 weekend, is wrapping up today. Yesterday I had a blast playing Queen Victoria for one of many scheduled geek-themed happenings – a Doctor Who-inspired “Torchwood Tea.” I chatted with wonderful people who had gone all out in the costume department (I met several Doctor Whos, a Dr. Horrible, a Stormtrooper, a student from Hogwarts… the list goes on and on and on). As I sat in the Wake Up Jake restaurant surrounded by people so loyal to their subculture, I thought about my own inner geek. I do not speak Klingon, I have seen each Star Wars film only once (back when they first came out), and I was only introduced to Doctor Who this past year. I would have thought that meant I do not meet the qualifications of a proper “geek.” Much to my surprise and delight, however, I have discovered that being a geek doesn’t mean I have to be interested in the things everyone else is. Quite the opposite, in fact: true geeks are simply unafraid to show their unabashed interest for a particular subject that turns them on. I have discovered, therefore, that I am a museum geek. My love affair with exhibition spaces began many years ago, with my first visit to the Royal British Columbia Museum. Like so many children, I was mesmerized by the fact that I could walk into a building and within its walls discover an ancient forest, a Victorian town, a room filled with towering First Nations carved poles, and so much more. My lifelong romance with heritage sites also began when I was a small child, after my inaugural visit to Barkerville Historic Town. I instantly loved the old, original buildings, the dusty streets and the interpreters in role. I met these twin treasures, the Royal BC Museum and Barkerville, with the untainted imagination of a child. These locations felt sacred and mysterious, and significant in ways that I could feel even if I could not fully understand. As an adult I still experience childlike wonder whenever I visit a museum, anywhere in the world. The smell, the lighting, the text panels waiting to be read, the artifacts, the buildings and displays, the interpreters – all signals that I am in a place that holds stories that matter. I have thoroughly enjoyed writing these 20 articles about Barkerville. This exercise has allowed me to understand more about my own relationship to our incredible site, and museums in general. Through the exploration of different themes each week I have been able to revisit my long walk with BC heritage – from my earliest days of museum discovery, to my struggles with ethical interpretation of the colonial era, to the realization that Barkerville is more than just where I work; it is part of the story of my life. If I have a final wish for you, the reader, as I sign off for the season, it is this: I hope you continue to support, love, question, challenge, and most of all, visit Barkerville. I hope you will do the same for any museum you encounter during your personal wanderings. The next time you pass through some small town, look for its local museum. When you visit major metropolitan centres, seek out museums and heritage sites and contemplate the museology behind these great institutions. Be brave and visit a museum that is out of the ordinary – like “The Museum of Toilets,” “The Garbage Museum,” and “The Mustard Museum” (all real places). And, of course, the next time you are in our area, come see us in Barkerville. I hope we can all unabashedly appreciate that one of the great heritage treasures on this continent is right here in our own backyard. 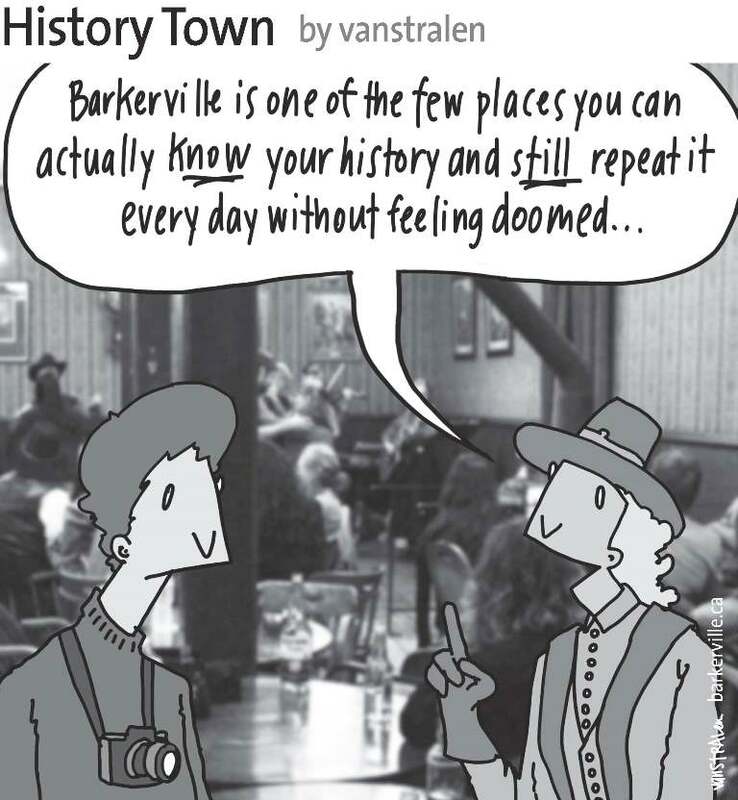 The above one-panel cartoon (originally published October 2nd, 2013) by Dirk Van Stralen, with accompanying editorial by Danette Boucher, is the twentieth and final of twenty weekly entries that were logged – and subsequently blogged – as part of a 2013 collaboration between Barkerville, British Columbia and the Prince George Citizen aimed at introducing some of the quirkier advantages to living, working, and playing in the Cariboo Goldfields. We hope you have enjoyed!